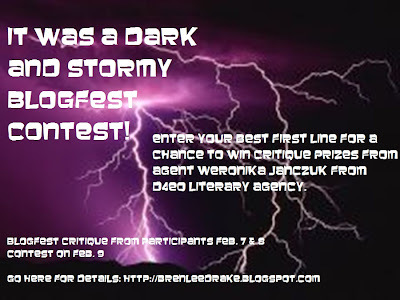 There’s only one week until It Was A Dark and Stormy Blogfest Contest judged by Weronika Janczuk on February 7-9. Click here to join in the fun (or just scroll down to the previous post, whichever). So, today I’m pleased to post my interview with Weronika for you all to get to know her better, which only made me more excited for the contest. I’ve been awestruck by the fabulous Weronika Janczuk. Her generosity and talent abounds. Not only is she a wonderful agent where she gives great advice on her blog Lightening + Lightening Bugs (a blog on publishing), but also she writes such beautiful prose on her blog A Room of One’s Own. You can read more about Weronika (pronounced Veronika) here. I’d like to welcome Weronika to my blog *waves*. I’ve read that you’re a tea drinker and the lover of witty books. If you’re curling up on the sofa on a cold winter’s night, what tea are you drinking and which witty book is on your lap? I’m addicted to Earl Grey, with a bit of sugar and a squeeze of lemon juice. As for a witty book, anything by David Sedaris (at this fine moment in time; it changes constantly). Earl Grey is my fave too (promise I won’t stalk you, okay only on twitter here). So, you were a freelance editor and an intern before getting your agent gig at D4EO Literary Agency. How did those jobs prepare you for agenting? I learned nearly everything there was to know before getting started. Some things you can’t learn without actually doing them, such as delving into the process of editing a book or compiling a submissions list; other things—such as how to read with an editorial/agenting eye (“Will this sell?” “What do we have to do to make this saleable?”), how to write a pitch letter, how to deal with contracts and royalty statements and payments, how to handle the publicity/marketing for clients, etc.—I learned from the variety of pre-D4EO gigs. I agree. You can sit on the sidelines and take notes, but it’s not until you dive into the thick of it and get dirty do you learn the game. You’re a writer as well. What genre do you write in and how do you schedule time to write? I write YA, literary and historical fiction; I’m currently working on a YA. (If you’re curious, I blog about the writing process here.) I don’t schedule time to write—I write whenever I have time, which means I have to be caught up with everything client-related and have enough of a buffer to leave queries or requested manuscripts for a day or two. I try to be expedient with everything on the agenting end, so writing comes after. And I thought I was busy. You really have to juggle your time. Do you work closely with your clients on revisions before submitting a project to publishers? Oh, yes. At least one round of revisions, most often multiple rounds—sometimes these revisions take months (and add to that the slowness of publishing; people wonder why it takes months to sell a book). I can believe that, my revisions have taken. . . Well, anyway, what are the common mistakes you see writers make when querying you? I don’t read queries. I jump into the pages—with those, it’s starting in the wrong spot; not completely clean writing; cliché scenarios; non-distinctive voice; etc. Well, that’s encouraging to know for those who struggle with the query. Your blog says you represent adult fiction. Is there anytime you’d consider looking at representing young adult or middle grade fiction? There is some discussion at the agency about this being a possibility in the future, but at this point, I don’t read unsolicited queries. I am, however, actively looking for writers online, for example, whose description of their work intrigues me.That’s wonderful and why being online is important. You never know who’s reading your stuff. What are you looking for and what do you see way too much of in the slush pile? I am still especially looking for a romance, a thriller, a sci-fi, a horror, and some more women’s fiction, but I am always happy to take on great literary fiction, commercial fiction, non-fiction, and fantasy. Great list, I hope you find some of that here in the contest. Since this is a first line contest, do you have any pointers on how to make a first line zing? – Don’t make the first line a piece of dialogue. – Consider where you want your first paragraph of exposition/narrative to take the reader, and then focus on writing a first line that draws us right into the middle of that scene. – Some of the best first lines are a bit vague (“Mrs. Dalloway said she would buy the flowers herself”)—they don’t force details or a ton of information—but they still manage to force relatively specific questions that the reader wants answered (“Who is Mrs. Dalloway?” “Why does Mrs. Dalloway want to buy flowers?” “What flowers?” “Why herself?”). – The best first lines aren’t generic. If you’ve seen a first line similar to yours, rewrite. – It’s hard to put into words, but really good first lines are lively; they bring the story and the reader’s interest to life. Immediately from a first line a reader can sense that the writer has control over the unfolding story, so make sure that your decision regarding the first line is as calculated and purposeful as all decisions about a manuscript should be. Wow, excellent tips. With your editor eye, what’s the biggest mistake you see in the full manuscripts that you pass on? These problems include a lack of tension, a lack of build to a climax, a lack of events that harm the main character and/or force them to try harder, etc. The characters are usually not as proactive as I want them to be; you usually can’t have a book about a character reacting to the world around her. Sometimes the character is unsympathetic for other reasons. A lot of the times the writing doesn’t hold up. Sometimes I’m not sure what’s wrong—I just don’t want to keep reading. You have to invest the reader into the world and the characters so deeply that they won’t think twice about not finishing. Yeah, that tension bit is hard to master. How would you describe your agent style? Do you have teeth like a shark or are you as soft as kitten or somewhere in between? I’m not sure that I know what both ends of that spectrum look like. Like any good agent, I like to think that I am fiercely protective of my clients’ interests—their number one advocate in the office, when the book is going on submission, when it sells, when it comes to publicity/marketing efforts, etc. No good agent can be soft as a kitten in these situations, not when publishers are taking a long time to get contracts and payments out, etc. When dealing with editorial letters, I soften the editorial blow as much as I can by outlining what the client has done well (often very, very well! ), but I do not hesitate to be blunt in what needs to change—neither the writer nor I will get anywhere with the book unless what needs changing is changed. When a book is on submission, I remind the client that we have done everything we possibly can. We both think the book is as good as it’s going to get. I don’t think it’s fair to tell someone “It’s the editors, it’s not you” because, whereas that is true in a way, agented writers have to write for the perfect editor. So more than trying to soften the blow—which I will always do—I first and foremost try to encourage the writer in their next pursuit. I am heavily involved in a lot of my clients’ brainstorming and outlining and writing processes, so we are always looking forward. Great insight on how you handle your business and how you know when you need to be tough or a bit softer. Thank you, Weronika! In closing, can you leave us with your favorite quote? And thank you, Brenda! I look forward to judging the contest. 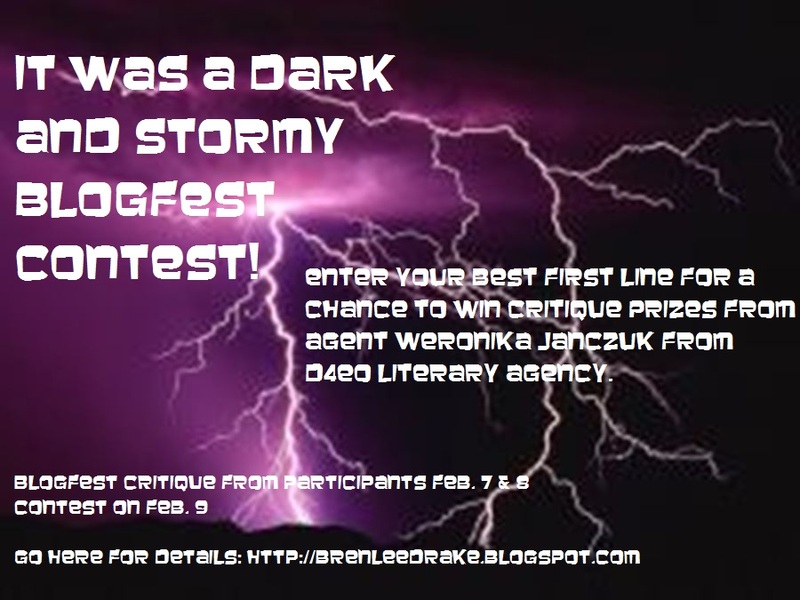 On Monday, post your first lines to your blogs and get critiques from fellow writers and then make sure to post that polished line by 8:00am EST on Wednesday February 9th in the comment section of the contest post. I’ll have that post up on Monday so you have plenty of time to enter it. And don’t forget to follow the DNA Writers blog for a chance to win a special free edit (prize to be announced) from CA Marshall! I’ll be drawing a name from the followers’ list and announce a winner on my blog. Oh, and one more thing, there’s a book trailer contest going on over at my friend’s blog FantasyFairy where you can win a free book trailer for your novel. Go check it out! Great interview Brenda. Thanks Weronika! Great tips for those first lines. Can’t wait for the contest! That was an interesting insight. What an excellent interview! I love Weronika’s outlook on submission and her openness. She makes me wish I wrote adult novels! You two are an excellent match Brenda! What a great interview. I love hearing an agent’s perspective and the first line tips are now stored away in my brain. Thanks for the first line tips, and just in time for the contest. I’ve been looking forward to this interview, and go by so late b/c I’m having troubles getting your blog to come up on my site. I had link problems tonight in the text also. Thanks to both of you! !